Before I sign off for the holidays, I thought I'd link to a couple of other places where I've landed on the internet recently. First is a profile on the blog for La Muse, a writers' and artists' retreat in France I attended in June of 2008. I had a wonderful experience and this quick interview will tell you a little about my time there. I also did a profile of Grassroots.org for the travel blog The Lost Girls. Grassroots.org provides free technical infrastructure to non-profit organizations. And even though I'm not in this next spot, I'm there in spirit. My delightful employers Jill and Molly over at StoryStudio Chicago are featured in a video on Beyond the Pedway. This will give you a glimpse into my writing home. (Chicago writers, you can check us out in person at our next Open House on January 12th). 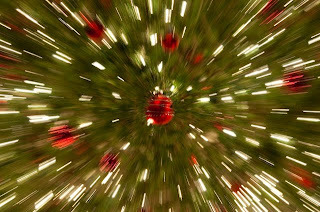 Happy holidays to all and talk to you again in 2010! Happy holidays, Lisa. I love the picture. Cheers!